With the Gregory & Davis App. Get real-time updates of all your consignments. Who are Gregory & Davis? Gregory & Davis Transport was established in June 1973 by two friends, both kings Langley residents, who were at the time looking for a gap in the market that they were willing to invest time and money into. The company not only has 40 years’ experience in UK road haulage, but 35 years of European as well, and Scandinavia. Since 1973 the company has provided such high levels of service that it has a very good record of retention with both customers and drivers. With our customers, this reflects our high levels of service, allied to our very competitive rates. The company prides itself on its service that it offers to its customers, and the friendly and honest way in which it conducts its business. So please do not hesitate to contact us with your logistical problems that we will endeavour to solve. The App from Gregory & Davis makes tracking your deliveries a piece of cake! The app is free and available on the Apple store and the android play store. 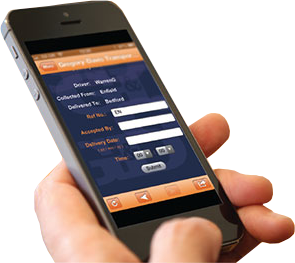 Gregory & Davis drivers send real time information on your delivery. When your goods are delivered, you receive an immediate email stating time, name and date of your consignment.